Henry Eugene who, you ask? Henry Eugene Vandervell may not be a name that resonates with you or rolls right off your tongue, but without the important pioneering and inventive work of his nineteenth century Briton, skating quite definitely may not have evolved into what it is today. Born in 1824, Vandervell was a British gentleman and father who with Thomas Maxwell Witham penned the 1869 book "A System Of Figure-Skating: Being The Theory And Practice Of The Art As Developed In England, With A Glance At Its Origin And History". Not a mouthful at all! Vandervell and his co-author Witham were both members of the London Skating Club and although their book was not the first detailed text on the subject of skating (British Second Lieutenant Robert Jones of the Royal Artillery published the world's first instructional book on the sport in 1772), it was certainly one of the first to offer really thorough instruction and education to would-be skaters. Offering a healthy dose of figure skating history of the time including a look at the Regent's Park Tragedy and Jackson Haines, the book also amusingly sports chapters with names like "The Combination Of The Inside And Outside, Or Vice Versa, Forwards Or Backwards On One Foot, Called Also The Serpentine Line", "The Skating Club Figures", "Loops And Q's", "Alternating Movements" and perhaps most interestingly, a chapter on "Nondescript Figures" such as "The Canadian figure", "Imitation of the ordinary walk", "the Mercury figure" and "Cutting out a name". The diagrams of the school figures therein the book are really quite concise considering what you might expect in the 1860's and although the changes of direction, edge and what foot is used are clearly marked, the actual turns used are marked by little black and white footprints. If you do a little more digging in the book, you learn that Vandervell and Witham actually invented the Counter and Bracket turns during the winter of 1860 and 1861 after finding themselves on the Long Water at Kensington Gardens that winter studying the differences of major turns and edges. The Counter and Bracket turns (along with the Rocker) were in the interim of Vandervell and Witham's book being published then introduced to the more traditional and staunch English Style of figure skating in the coming years. 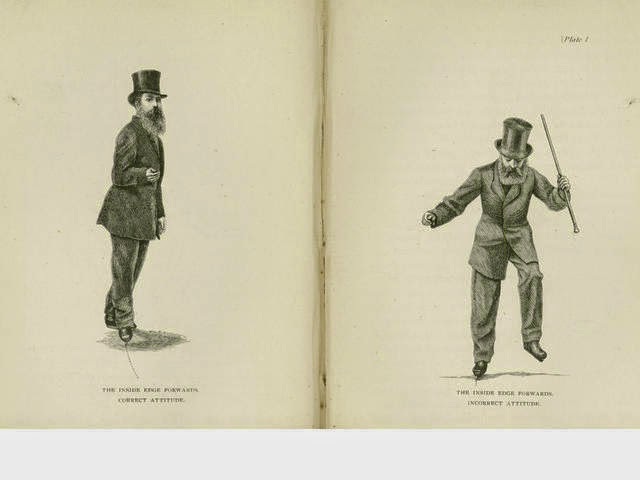 They soon caught on in figure skating's Continental Style of the era and were later represented in the 1881 book "Spuren auf dem Eise: die Entwicklung des Eislaufes auf der Bahn des Wiener Eislauf-Vereines" by von D. Diamantidi and M. C. V. Korper. The latter book's illustrations and instructional diagrams of school figures would prove to be those later adapted and used in world competition. Vandervell's writing and invention of the Counter and Bracket turns with Witham wouldn't prove to be his only important contributions to figure skating. In 1880, Vandervell would pioneer the concept of testing by developing bronze, silver and gold tests for Britain's then National Skating Association which was based in Cambridge, England. T.D. Richardson shared a letter by Vandervell to his friend Monier-Williams written on Hallowe'en 1900 and inscribed as a dedication in a copy of his book which was later donated to the Isthmian Library: "To my friend, H. E. Vandervell. As a token of admiration and respect. First, in the sixties, to lay the foundation of Scientific figure-skating, and today still foremost in the encouragement of every progressive movement in the Skating World. The letter in question contains the following: The first class test gave me a lot of anxiety. The object I had in view was to entice the skater... and to give him a little pat on the back as he went forward to the desired end... The N.S.A. figure tests were originally designed to take in the masses as well as the classes. The former never appear to have caught on to any extent, but it might be well to remember that we had their interests at heart if they knew what was good for them!" Much like Vandervell's other contributions, the concept of testing gained popularity internationally. As we all know, it is really the cornerstone of development for skaters at all levels. Those of us who have skated have all taken tests and a generation from now, I'm certain those to come will too. It must have come as a huge shock to Vandervell and the disciples of that rigid, straight legged, corseted "English Style" when between 1865 and 1870, an American named Jackson Haines with a style that was a complete polar opposite of what Vandervell was pioneering arrived in Great Britain showing off the free skating he had popularized with skaters on the continent. Vandervell was undoubtedly resistant to Haines' style as Steve Milton wrote in his book "Figure Skating's Greatest Stars" that in London Haines "was disappointed there, as his 'fancy' skating, with its pirouettes, forward-leaning spirals and ballet moves was considered slightly effeminate and an affront to skating discipline." Vandervell passed away in 1908 (the same year Madge Syers won Olympic gold), but his impact not only lives on in through his pioneering work in developing skating but also in his 2015 induction into the World Figure Skating Hall Of Fame. One also can't forget the Vandervell Trophy, which was presented to Great Britain's National Skating Association in 1951 by Vandervell's sons and was to be awarded to the British skater who gave the best performance each year. The first winner of this trophy in Vandervell's memory was 1952 Olympic Gold Medallist Jeanette Altwegg and in years to come the trophy would be won by speed skaters and figure skaters alike. My understanding is that it is still presented to this day and I'm sure someone with such a passion for the sport's early development is looking down smiling at that. Are you liking Skate Guard on Facebook yet? I can't imagine why you wouldn't be, but if you haven't yet, I'll certainly forgive you... for now. Visit http://www.facebook.com/SkateGuard and click 'like' for updates on new articles, interviews and features or follow me on the Twitter at http://twitter.com/SkateGuardBlog for updates and non-stop skating news, views and tweets.